2 Anchor Hocking 9" Glass Pie Plates Just $4.99! Down From $16! You are here: Home / Great Deals / 2 Anchor Hocking 9″ Glass Pie Plates Just $4.99! Down From $16! 2 Anchor Hocking 9″ Glass Pie Plates Just $4.99! Down From $16! Anchor Hocking has some great 70% off deals right now! You can get two 9″ glass Pie Plates for just $4.99! Down from $16! 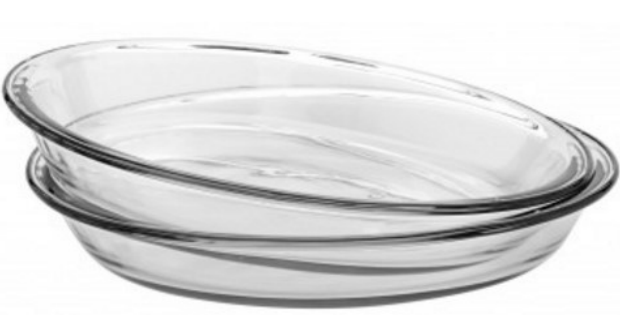 For comparison, you can get one Anchor Hocking Glass Pie Plate for $4.88 at Amazon. One at Walmart is $11.99! Essentials Bakeware is perfect for everyday needs. Bakes evenly with its round edges and it’s a great size for family meals or get togethers. There are many other great deals, too, be sure to check it out!